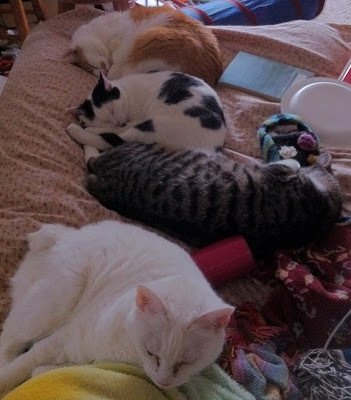 i captured this today.. the 4 sleeping in a row. amazing that mr. alpha was willing to sleep right next to shlomo-lomo. btw, prescription that’s – from closest to furthest.. old bitty ava p, visit web bilal, troche shlomo, max. and this. shlomo is growing up. he’s finally starting to rub against my legs as i walk around the apartment. i found him doing this today with his brother bilal. notice the front leg over bilal like that? i just think that’s adorable. oh, and btw, lal and lomo really are unsepearable.. wherever lal goes, shlomo isn’t far behind. i think it is simply adorable.